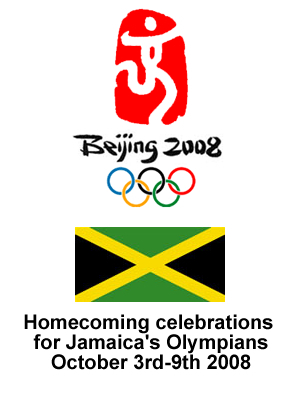 Sevens days on celebrations to recognize and celebrate the achievements of Jamaica’s Beijing Olympic team to get under way starting on Otober 3rd, 2008 starting with a motorcade through the capital city Kingston. The motorcade will begin at the Harbour View roundabout, will move along Michael Manley Boulevard to Port Royal and Duke streets, Marcus Garvey Drive, up Hagley Park Road, Hope Road, Trafalgar Road, along Knutsford Boulevard onto Oxford Road and Tom Redcam Avenue onto Arthur Wint Drive and conclude at the National Stadium Car Park. The Strawberry Hill Hotel will host a fund-raising dinner dubbed ‘Dining with the Stars Under the Stars’ for the Jamaica Amateur Athletic Association’s Programme of Development for the Track & Field Athletics Team. On October the 4th the National Awards Ceremony and Sports Gala will be held at the National Stadium beginning at 3:30 pm. Various National and special awards will be conferred on gold medal winners Usain Bolt, Shelly-Ann Fraser, Melaine Walker, Veronica Campbell-Brown, Asafa Powell, Nesta Carter and Michael Frater. This event will be streamed live via the internet. A national thanksgiving service will be heald at Emancipation Park in New Kingston on October 5th. On October 7th the celebrations head to the western section of the island with motorcade from Montego Bay to Falmouth and then to the sports gala and homecoming celebrations at the Trelawny Multi-Purpose Stadium the following day. The celebrations end on Friday October 9th with a Digicel-sponsored fund raising banquet at Vale Royal with the proceeds of that banquet will going towards Special Olympics Jamaica.